A NIGHT AT THE ODEON - OR I’LL HAVE A BLUE CHRISTMAS! Queen dominated the singles chart as Bohemian Rhapsody took the country by storm at the end of 1975 and was the years No.1 Christmas single. This new single accompanied by a film was shown on ‘Top Of The Pops’ became the talk of pubs, offices, shops and factories across the land! They filmed this because their scheduled appearance coincided with the opening night of their ‘A Night At The Opera’ tour and the band were in my own city of Liverpool. It was here Queen were given copies of the new album cover after listening to a playback of the album at Radio City, which Freddie proudly displayed to the audience at the shows. Queen were dominating theatres the length and breath of the United Kingdom. Extra dates were added due to exceptional sales. They were 11 shows in before the release of their new anticipated album. It was announced that an extra date had been added at the very end of the tour. This was no ordinary show, this was to be broadcast live on BBC television with a simultaneous broadcast on BBC Radio. The date and venue were set. 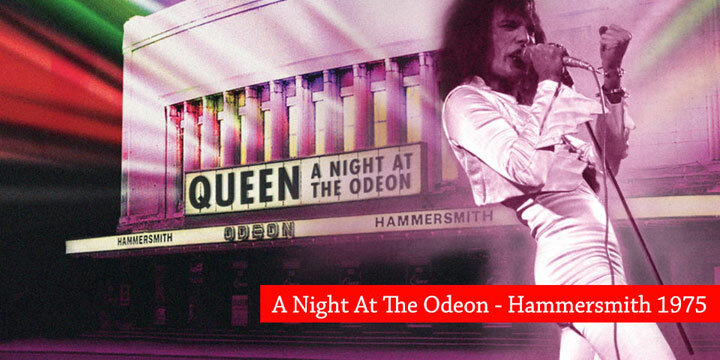 Their 6th appearance on the tour at the prestigious London Hammersmith Odeon, or Hammy O as it had become affectionately known and the show was to be held on Christmas Eve. I wanted to go to this show as I had seen a few concerts on tour and disappointed Freddie hadn’t worn his Japanese kimono at any of the ones I’d attended and I thought, oh he will wear it at this show, especially as it’s on TV! The tour wound up in Glasgow and Queen travelled down to Brighton to see Hot Chocolate and whilst in the hotel restaurant Errol Brown burst in yelling at Freddie that Queen had stopped his group from reaching No.1! Freddie was amused! Brian and Freddie caught a cold and had problems walking and the day before the show their doctors advised they didn’t play their Christmas concert! Thankfully they ignored this advice and decided to play. Phew! The Fan Club managed to obtain a ticket for me but guess what? There were no late night trains running back to Liverpool from London Euston due to the Christmas holiday as train services were finishing early! I needed to be home for Christmas, didn’t want to be stuck in London for a couple of days! Roger went along to London Capital Radio to promote the show earlier in the day and joined John, Brian and Freddie to prepare for their performance which would reach out to more people than they had ever played to in one show ever! This would be a highlight of their career so far, their first ever live television show and boy I really really wanted to be there! The fans arrived to be greeted by the evenings compere and host of ‘Old Grey Whistle Test’ dressed in white top hat and tails and took the place of Kenny Everett who introduced the shows on tour (on audio). The opening was different to the tour and Freddie stood behind a screen using an effect from the new video! Lights, camera and action and the Queen machine exploded live on TV across thousands of living rooms, including my living room! Cassette player set up in front of the television ready to record the concert for posterity! Christmas Eve is usually a big drinking day for me, but this year I kept it low as I didn’t want to miss the concert. The things I do for Queen! I can clearly remember watching, thinking I could have been there! I was so disappointed I couldn’t go. It was rather a damn good show too, the energy of a Queen live show bursting through the TV screen. Queen gained even more fans after this! Three days later ‘A Night At The Opera’ reached No.1 in the UK album chart! The live broadcast cut short before the ending of the televised encore and it would be a year later before we were privileged to see the programme repeated due to public demand and it was shown to the end! It would be 8 years wait to see 20 minutes of the gig, unanimously voted for by the British public on BBC TV’s ‘Rock Around The Clock’. A further edited show was shown on BBC in 2009 and repeated many times since as ‘The Legendary Concert’. Radio all around the world has broadcast the show. It has become legendary status amongst media and fans! Luckily the show has been show often at Fan Club Conventions, always a treat to watch. Now 40 years on the show will finally be released in its entirety. Well maybe not in its entirety as the bands second encore was not filmed. Cameras stopped rolling after the TV broadcast had ended but the audio was recorded thankfully. So some small mercy! It’s exciting to see another 70’s concert officially released following hot on the heels of the Queen At The Rainbow ’74 show! This is Queen really making an impact on the live stage and propelled them to mega status. Watching this show will take you on a journey with them, they gave us some rock ‘n’ roll! The recording has been digitally remastered and the film restored. Wonderful. How good to know I can sit and relive Christmas Eve 1975 whenever I want to. Deep down I still wish I was there on the night but thank you BBC for recording the show and thank you Freddie, Brian, Roger and John for putting on such a memorable performance. The band returned to this theatre on Boxing Day four years later and I was determined not to miss that, and I didn’t! That’s another story! Oh by the way, yes Freddie did wear the kimono! Aaaaaarrrrrrggggghhhhhh! A Night At The Odeon is released November 20th on CD, DVD, SD Blu-Ray, 2 LP vinyl, Super Deluxe Box Set and digitally.